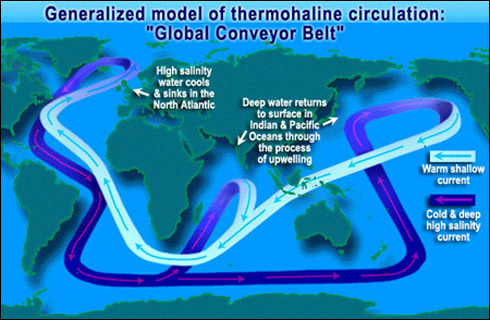 The Gulf Stream is one of the strong ocean currents that carries warm water from the sunny tropics to higher latitudes. The current stretches from the Gulf of Mexico up the East Coast of the United States, departs from North America south of the Chesapeake Bay, and heads across the Atlantic to the British Isles. The water within the Gulf Stream moves at the stately pace of 4 miles per hour. Even though the current cools as the water travels thousands of miles, it remains strong enough to moderate the Northern European climate. 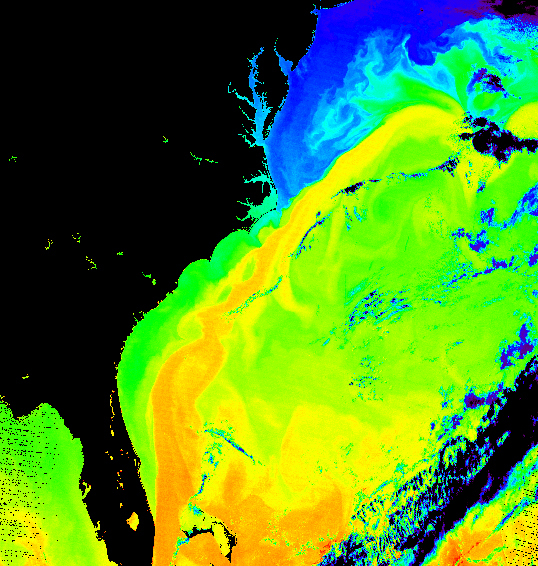 Off the Atlantic seaboard of the United States, the Gulf Stream flows at a rate nearly 300 times faster than the typical flow of the Amazon River. The velocity of the current is fastest near the surface, with the maximum speed typically about 5.6 miles per hour (nine kilometers per hour). The average speed of the Gulf Stream, however, is four miles per hour (6.4 kilometers per hour). The current slows to a speed of about one mile per hour (1.6 kilometers per hour) as it widens to the north. The Gulf Stream transports nearly four billion cubic feet of water per second, an amount greater than that carried by all of the world's rivers combined. The Gulf Stream, together with its northern extension towards Europe, the North Atlantic Drift, is a powerful, warm, and swift Atlantic ocean current that originates in the Gulf of Mexico, exits through the Strait of Florida, and follows the eastern coastlines of the United States and Newfoundland before crossing the Atlantic Ocean. At about 30°W, 40°N, it splits in two, with the northern stream crossing to northern Europe and the southern stream recirculating off West Africa. 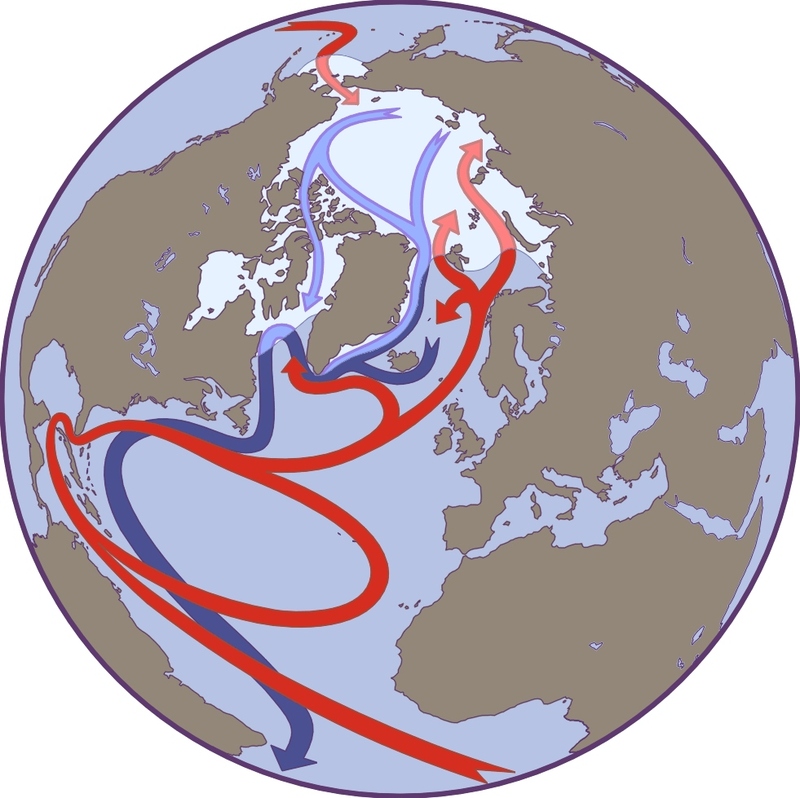 The Gulf Stream influences the climate of the east coast of North America from Florida to Newfoundland, and the west coast of Europe. This warm water then flows up the Norwegian coast, with a westward branch warming Greenland's tip, at 60°NIt keeps northern Europe about nine to eighteen degrees warmer in the winter than comparable latitudes elsewhere. 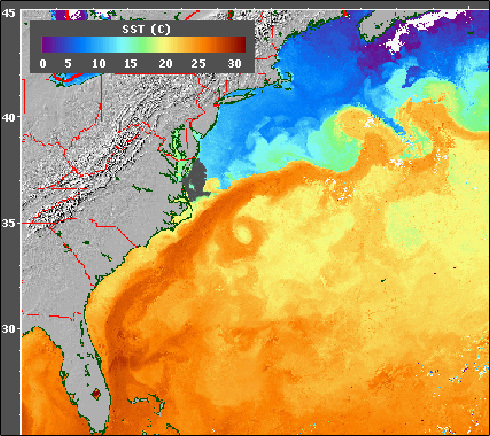 Pictured above is the East Coast of the United States, in grey, with the Gulf Stream, in orange, revealed through Sea Surface Temperature data (SST), made from the AVHRR (Advanced Very High Resolution Radiometer) sensor carried on a NOAA satellite. In this image, purple and blue represent the coldest temperatures (between 0-15 °C) and orange and red represents the warmest temperatures (between 22-32°C). The Gulf Stream is easily visible as the warmest water in the image and reaches from the Carribbean to as far north as Delaware. Credit: Gulf Stream Tutorial. Climate Change could alter this. Because freshwater is less dense than seawater, increased precipitation, melting of polar glaciers and ice caps could block the system by reducing the amount of cold water that sinks downwards. 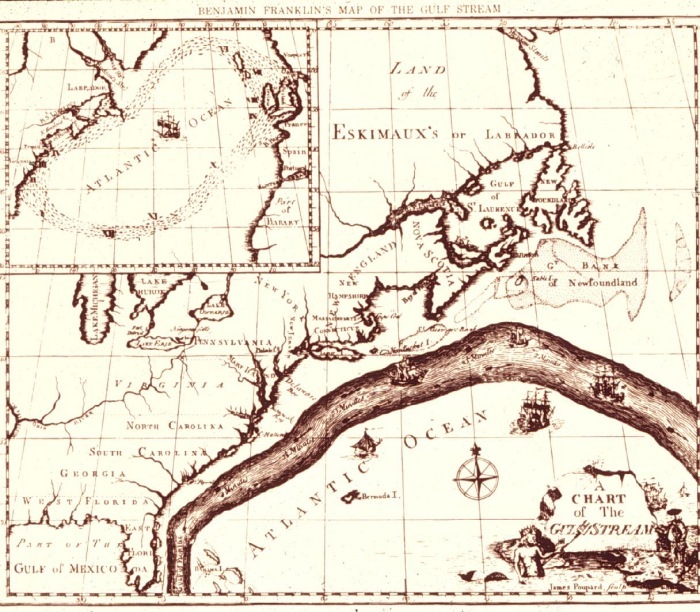 In the Atlantic, warm, high-salinity water flows northward in the Gulf Stream along the east coast of North America. Some of this water continues northeastward in the North Atlantic Current toward Iceland and Norway. 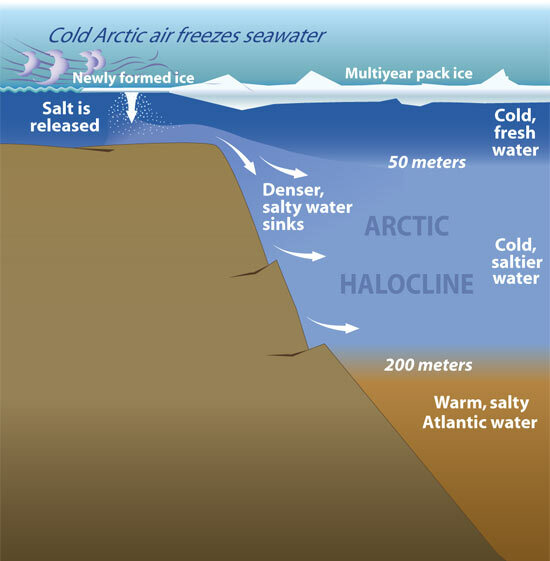 Off the coast of Greenland, a portion of the surface water cools, becomes dense, and sinks. A further portion of surface water continues into the Arctic Ocean before also cooling and sinking. Together these sinking plumes off Greenland and in the Arctic form "deep water" that plays an important role in global oceanic circulation.